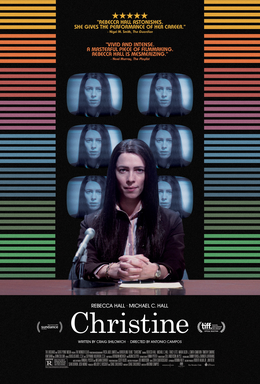 Based on the infamous live on-air suicide of newsreader Christine Chubbuck, ‘Christine’ is an engrossing psychological drama that attempts to explore the woman behind the headlines, and ultimately what led her to such drastic and shocking action. It’s a story I’d heard about before, and it’s widely considered a key influence on the excellent 70s movie ‘Network’, which has its focus on an increasingly rattled newsreader (played by Peter Finch). The film focuses on Christine’s life in the weeks leading up to the suicide, depicting both her personal and professional lives with a great degree of thoroughness. Played by Rebecca Hall, Christine is an unhappy individual who struggles to connect with other people, and the reasons for this become more apparent as we start to learn about her background. This film remains firmly in the character study realm and virtually every scene follows Christine as various events in both her personal and professional lives lead her to despair. She takes her work very seriously and this leads to regular clashes with her boss (Tracy Letts), who is focused purely on ratings at the struggling station and wants her to change tack from human interest stories to crime. The time period (start of the 70s) is fairly key as it’s a period when news stations were able to get away with slightly more exploitative content and the appetite for serious content was dwindling. To an extent this can be seen even more so now in the 24 hour news cycle and I’ll take any opportunity to recommend the outstanding ‘Nightcrawler’ which explores this subject to equally dark ends. However, this is a film about Christine Chubbuck, the person, and less about the wider themes it touches on occasionally. The struggles in her professional life are replicated by those in her personal life: At 29 she’s still a virgin who lives at home with her mother, she harbours a crush on her co-worker (Michael C. Hall) and a recent trip to the doctors uncovers a problem that may threaten her ability to have children. We witness her go through various awkward situations with strangers, co-workers and family, and its difficult watching her trying to connect and to be taken seriously. All of these situations weigh heavily on Christine and the film depicts her mind starting to unravel as she experiences setback after setback, culminating in the decisive action at the end of the film. It’s a film with a pre determined end point but it still manages to build tension superbly, and the foreknowledge of what happens doesn’t make it any less effective. This is primarily down to Rebecca Hall’s tour de force of a performance, and she’s absolutely mesmerising in bringing this character to life and making her feel like a real person and not a headline. Over the course of the film we empathise with each knock she takes, and the film has a lot to say about the downsides of relying on your professional career to make up for the issues in your personal life. Given we’re in awards season, it’s worth noting how disappointing it is that Rebecca Hall has been overlooked by several of the main awards bodies, particularly when Meryl Streep continues to get nominated for turning up in mediocre fare, but that’s the way things are! ‘Christine’ is an insightful drama driven by a gripping performance from Rebecca Hall that helps to do justice to the real person and true story behind the film’s subject matter.